240 pages of Forney's War Press published in 1863. 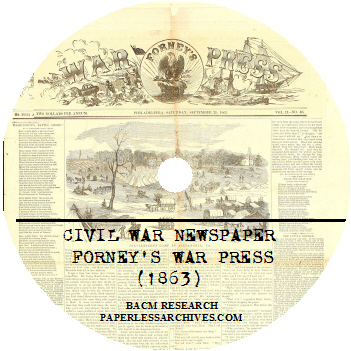 Forney's War Press was a newspaper dedicated to carrying Civil War news. Issues were published weekly in Philadelphia, Pennsylvania and contained engravings, news from war correspondents, casualty reports, poetry, and humor. War Press was published by John W. Forney, who was born in Lancaster, Pennsylvania in 1817. His career in publishing began as an apprentice at the Lancaster Journal. In time he became the Journal's owner and editor. He was Clerk of the United States House of Representatives 1851-1856 and 1860-1861, and Secretary of the United States Senate 1861-1868. Each issue contained eight pages. The masthead of the newspaper was an ornate illustration containing an eagle, warship, cannon, and soldier's in battle. This collection contains 30 issues from 1863. The issues are: January 3, 10, 31: February 21, 28: March 14, 21: April 18, 25: May 23: June 13, 20, 27: July 4, 18, 25: August 8, 15, 22, 29: September 26: October 10, 17, 24, 31: November 14, 21, 28: December 5, 19. The October 31, 1863 issue printed below its masthead an illustration titled, "Rebel deserters in the mountain of North Carolina." Articles appearing in that issue included: The Whiskey Rebellion of 1794. Henry Ward Beecher at Manchester. The Slave Power and England. The Contrabands. Emancipation. Colored Schools in New Orleans. Recruiting of Negroes in Maryland. The Freedmen in Virginia. The Raid on Pennsylvania. Governor Andrew G. Curtin and the Late [Gettysburg] Campaign. A Worthy Tribute to Governor Curtin. Rebel Theory of Lee's Forward Movement. The Plans of General Lee. The War in Virginia. The Rappahannock Crossed by a Rebel Force. Brisk Cavalry Skirmish with the Enemy. Army of the Potomac Recent Campaign Reviewed. The Spanish Democrats and President Lincoln. 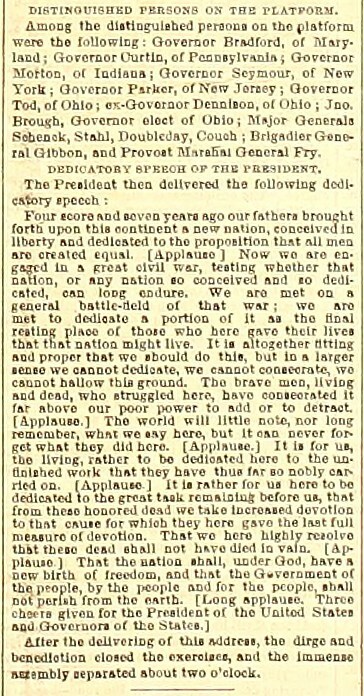 Letter of President Lincoln to the Missouri Delegation. Instructions to General Schofield. Policy of the Democratic Leaders. The Union Meeting in New York. The N.Y.C. Riots. Proclamation of Governor Seymour. The Ohio Election. Mr. Vallandigham on his Defeat. Mr. Sumner's Speech. John Minor Botts and the Rebel Secretary of State. Remarkable Speech of Hershel V. Johnson. The Escape of Rebel Prisoners at Camp Douglas. Condition of the Union Prisoners in Richmond. Chattanooga. General Rosecrans at Cincinnati. General Rosecrans Successor. The War in the Southwest; Operations near Corinth. The Kentucky Raid. The Fight at Blue Springs, Tenn. Official Dispatch of General Burnside. Born in Lancaster, Pennsylvania, on September 30, 1817, John Forney left school at age thirteen for a job to supplement his family's meager income. Three years later, he went to work as an apprentice in the printing office of the Lancaster Journal. By the time he reached his early twenties, the shrewd and enterprising young man had taken over as the paper's editor and owner. Along the way, he developed close ties to Lancaster's most prominent figure, U.S. Senator James Buchanan. In 1845, soon after Buchanan became secretary of state in the cabinet of newly elected President James K. Polk, he used his influence to gain Forney a coveted patronage position as surveyor of the port of Philadelphia. For the next quarter century, Forney followed a dual-career pattern, not uncommon in that era, of publishing newspapers while holding government jobs. When Forney moved to Philadelphia, he sold his Lancaster paper and became editor and owner of the Philadelphia Pennsylvanian. When the Democrats lost the presidency in 1848, Forney lost his surveyorship and relocated to Washington, D.C., where he went to work as an editorial writer for the Washington Daily Union. In 1851, he succeeded in winning election as Clerk of the House, a congressional position he had long coveted. Several years later, he purchased partial ownership in the Union. As Clerk, he used his influence with House leaders to obtain for the Union financially rewarding contracts for printing House documents. (Widespread controversy related to awards of printing patronage led Congress within a few years to establish the Government Printing Office.) In his most visible role as Clerk, Forney presided successfully during a rancorous two-month 1855-1856 House speakership contest. In 1856, Forney resigned his House position to campaign for James Buchanan's presidential election and his own election to one of Pennsylvania's U.S. Senate seats. After Buchanan won and Forney lost, the publisher asked the new president for a high-profile administration appointment. When political conditions frustrated Buchanan's efforts to accommodate him, Forney moved back to Philadelphia and established a new paper, the Press. He soon broke with Buchanan over the president's proslavery policies and the administration's inability to steer lucrative government printing contracts his way. In 1860, as Buchanan's failed policies were leading to southern secession and the breakup of the Democratic party as a significant political force, Forney shifted his political allegiance to the recently established Republican party. He again won election as Clerk of the House. When Abraham Lincoln became president in March 1861, he helped Forney gain the necessary votes to become Secretary of the Senate. While settling into his new responsibilities, Forney established the Washington Sunday Chronicle. The following year, he agreed to President Lincoln's suggestion that he convert the Sunday Chronicle to a daily newspaper. Soon, nearly forty thousand copies of the Chronicle were being distributed to the Army of the Potomac, responding to Lincoln's desire that a pro-administration newspaper be available to these troops. Forney established a newspaper in Philadelphia called the Press (sometimes called the Weekly Press). During the Civil War, this newspaper became known as Forney's War Press. After the war was over, the paper returned to its original name and Forney remained at its head until the 1870s when he sold the paper. It continued to be published until around 1880.